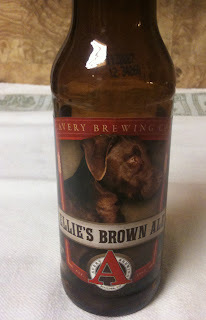 Tonight I will have an Ellie's Brown Ale from Avery Brewing Company. The twelve ounce bottle lists 5.5% ABV. 17 IBUs are listed on the web site. This brown ale poured with a medium, tan colored head. The beer color is a dark brown that lets a little light show through when the glass of beer is held up to a light. The main note in the aroma is some sweetness of brown sugar or caramel. Medium bodied. The caramel notes from the aroma carry through to the taste. Not overly complex, but tasty. Some nutty malt on the finish, which sticks with you a bit on the aftertaste.